Here’s a little fun online casino where you can play slot games. It goes by the name of PirateSlots. We will tell you about this online casino in this review. You will get to learn more about some of the important elements of it. You’ll get to know what kinds of games you can play. You will also get some information about the bonuses. If this sounds like something that may interest you, then you’re welcome to read the rest of the review. This is one of the strongest points of Pirate Slots. The casino has a very well-crafted theme. It’s mainly focused on the colors pink and purple. It looks good on the eyes. What this website could use however is a bit more animation. It can get rather stale and bland in a short while. The first impression is, of course, very good. There is one annoying little feature about this casino, however. Every time you open another tab on your explorer, the casino’s tab will start pinging you. The tab will start flashing and you will get two interchangeable messages. These are “Hey!” and “Come Back!”. Over and over and over again. I guess the web designers wanted to take a hold of your attention. However, all it does is backfire – you will want to shut the website down when you’re not using it. This isn’t a serious fault – it’s just a bit of a pet peeve that we have with the website. 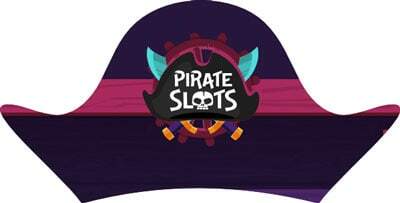 As you may have figured it out – Pirate Slots is all about the slot games. The sole exception to the rule is that there are bingo games as well. You will be able to many great slot games. Among them are Tut’s Twister, Shaman’s Dream, Bonanza, Starburst, and many others. If you love playing slot games, then you will have a time of your life at PirateSlots. There are also some progressive jackpot games. These games feature very big prizes for the luckiest of players. If you’re lucky enough, then you may be able to get a few hundred thousand dollars. Finally, there are the bingo games. There’s Lucky Stars, Free Bingo, Fair and Square bingo – and a few others. 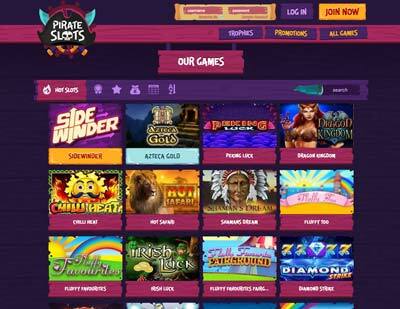 PirateSlots definitely has something to offer in the field of slots and great bonuses. However, if you want to play some other gambling games, we suggest you check some other online casinos. Even so, this is a fun place to spend some time and if you like pirates, it sure is a winner. Play safe!